It's the beginning of the New Year and many (if not most) of us are making resolutions to eat better, detox, lose weight, get in shape. Or, maybe you want to feel more grounded both mentally and physically. Perhaps all these things are your goals. Eating a nutritious and balanced diet can help you on your journey to looking and feeling great. Gena Hamshaw, nutritionist and author of Power Plates, says she designed her book with one simple premise: "to offer 100 practical, flavor-packed, balanced vegan meals" but without strict rules or overthinking it. Her book is not a diet book and the recipes are not formulated for weight loss, per se, but instead, they are meant to help you feel nourished and satiated - whether you're a committed vegan or a curious carnivore. The 100 recipes are divided into the following chapters: Breakfast, Salads, Soups, Bowls, Skillets and Stovetops, and Bakes. Many of the recipes are quick and easy, making them perfect for weeknight meals, but others do require a bit more time and planning. At the end of the book, she includes a sample menu but also encourages adaptation so you get the most out of each dish and each meal. One of my favorite dishes is the following Indian pancake known as pudla. 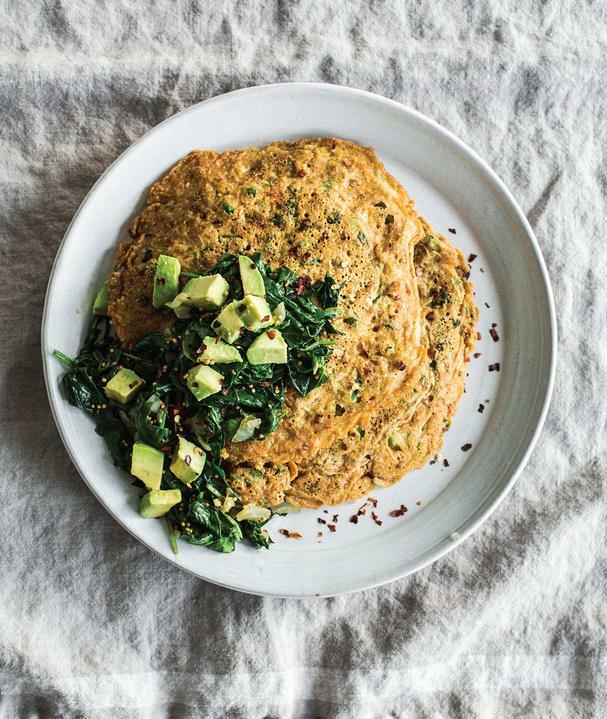 The batter of this pancake is made with chickpea flour and incorporates peas and fresh cilantro. They're fried up in a skillet, then topped with a spicy sauté of spinach, onions and garlic, mustard seeds, red pepper flakes, and a squeeze of lime juice. Add some fresh herbs, such as cilantro, and a dollop of chutney for even more deliciousness. To make the pancakes, bring a medium pot of water to a boil. Add the peas and blanch for about 2 minutes, until bright green and tender. Drain immediately. In a large bowl, whisk together the chickpea flour, baking soda, salt, pepper, turmeric, and cumin. Whisk in the water until the batter is smooth. Stir in the lime juice (the mixture will froth briefly), then fold in the tomato, cilantro, and peas. Heat 1 teaspoon of the oil in a 10-inch (25-cm) skillet over medium-low heat. Ladle in one-quarter of the batter; it should form a pool about 8 inches (20 cm) across and 3⁄4 inch (2 cm) thick. Cook for about 3 minutes, until bubbles form on the upper surface and the bottom is starting to brown. Use a large spatula to flip the pudla (if it gets a little messy, that’s fine). Cook for 2 to 3 minutes, until the second side is starting to brown, then transfer to a plate. Repeat three more times with the remaining batter. To prepare the spinach, trim away the lower stems, then coarsely chop the leaves. Heat the oil in a large skillet over medium heat. Add the onion and cook, stirring occasionally, for 3 to 4 minutes, until the onion is tender. Add the garlic and mustard seeds and cook, stirring constantly, for about 2 minutes, until the mustard seeds begin to pop. Lower the heat to medium-low. Add the spinach in big handfuls, stirring well after each addition. When all of the spinach has been added, cook, stirring occasionally, for 3 to 4 minutes, until the spinach is bright green and tender. Season with salt, red pepper flakes, and lime juice to taste. Serve the pancakes cut into wedges, topped with the spinach and accompanied by any other desired toppings.